Have you ever found yourself working on a project and coming up with ways to improve things? Humans have a strong and compelling desire to just keep improving and optimizing something. It’s in our DNA. I’ll give you an example from an investment angle. An investor wants to put capital into the stock market. They start out by saying, “I’m going to be a buy and hold type investor.” That sounds reasonable enough. Buy and hold it is. I’ll buy low and hold on and someday I will sell higher. But then along the way a market pullback or correction happens which leads the investor to say, “I have an idea. Instead of just buying and holding, I’ll sell when things run up fast and lock in those gains and then buy back in as prices fall back down into ranges that seem to be a part of past experience.” Now buy and hold becomes, buy, hold shorter, sell, wait for correction, buy back in, repeat. Once the investor does that once or twice (maybe even with some success) they start to realize that within that longer time table of them buying, holding, selling and re-buying that there are some smaller cycles within the bigger cycles. So the key to optimizing returns is to buy, sell, wait and buy again along a faster time period and along shorter cycles. Next the investor says, “If I use some leverage, I can make quicker gains within shorter time periods which would compound money even faster.” So a margin account is set up and leverage is used. While the margin account is up and running, they start looking at buying options. This way when they buy, sell and are waiting to buy back in, they could perhaps do some covered call buying to generate income on stocks that don’t have a lot of underlying volatility. This will improve cash yield while waiting. This is done to optimize the system. Next up is shorting stocks. Why should the investor just buy, sell and then wait for prices to come down before buying again. That is not maximizing time as efficiently as possible. While waiting for prices to fall back down after run-ups, the investor should sell short to capture the downside move during the now even shorter investing cycles that the investor is chasing. Wait, it can be improved! The investor can start using multiple strategies simultaneously amongst various markets like equities, bonds, commodities, real estate, options, futures, and throw in some gold or metals to really give themselves a chance to “always make sure that they have something cooking in the oven.” You have to optimize if you want to make it big. So eventually the investor is buying and selling quicker and quicker, going long and short, using leverage, playing in the option and futures markets and placing capital in multiple markets and asset classes. Before you know it, every attempt to optimize the strategy ended up just moving the investor further and further away from a strategy that would provide the highest probabilities of eventual success. As more effort was being made to optimize, more noise and complexity was added to the overall system. Before you know it, the system is so complex, so confusing and so noisy that the chances of success are slim at best. Understand the core essence of the strategy. What is at the heart of the matter? What is going to move the needle the most and provide the biggest return on effort? It’s possible to quickly lose sight of the fundamentals of success. We often see this in sports when a championship team does all the basics very well (like playing solid defense) while competitors try all kinds of tricky strategies and fail to win. Assess if the additional layer of optimization can be mastered. This world is complex and is full of people that are experts in small areas of focus. It’s a very competitive world. Is it possible to be a great surgeon and top real estate investor in your spare time when there are people that dedicate 100% of their efforts on being great at either surgery or real estate investments? Do you know what you are trying to master and are you working towards mastery of that particular item? Are you achieving the desired results? If you are getting the results you want and are making forward progress, then there is nothing wrong with developing and evolving to higher levels of mastery and execution. 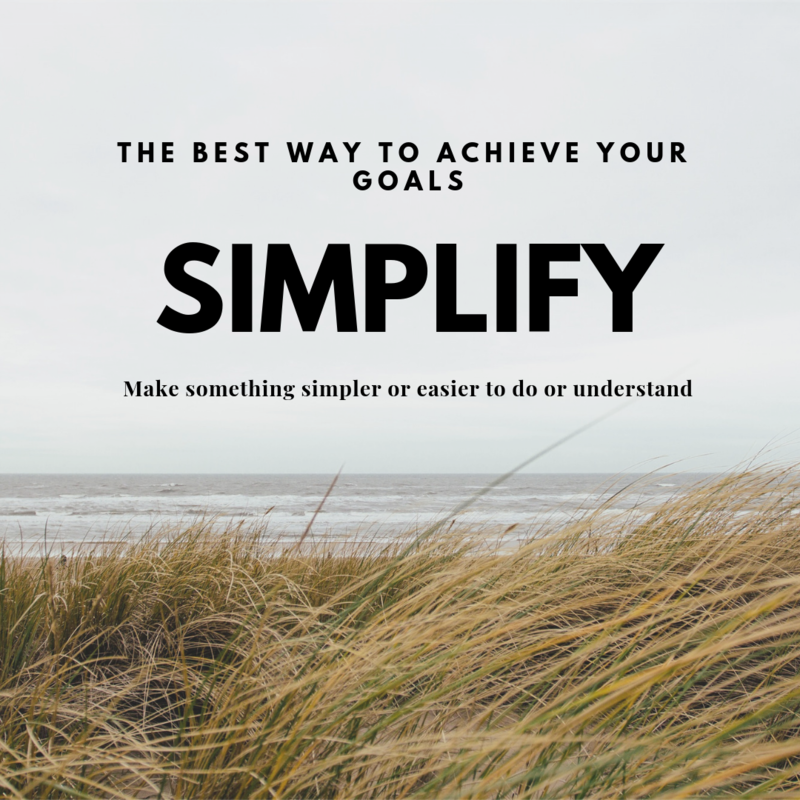 But if you are moving further and further away from you goals and objectives, perhaps you are not able to execute on the basics and need more work on simplifying on things that matter and working on fundamentals. Be realistic about your personal systems. There is beauty in simplification. Complexity isn’t always the answer nor is the constant need for optimization to the point where everything just breaks down. Start with basic fundamentals and the simplest approach that can help you achieve your goals as safely as possible. This applies to many endeavors such as sports, education, finance, health, relationships and personal challenges.